This simple cabin of cypress logs in Hampton signifies the federal government’s attempt to relieve struggling states of the economic destitution that resulted from the Great Depression. President Herbert Hoover signed the Reconstruction Finance Corporation into law in 1932, allowing the federal treasury to provide loans to institutions such as banks, railroads, and family assistance programs – particularly in the southern states. South Carolina received over $2 million in RFC funds, $38,000 of which went to Hampton County. 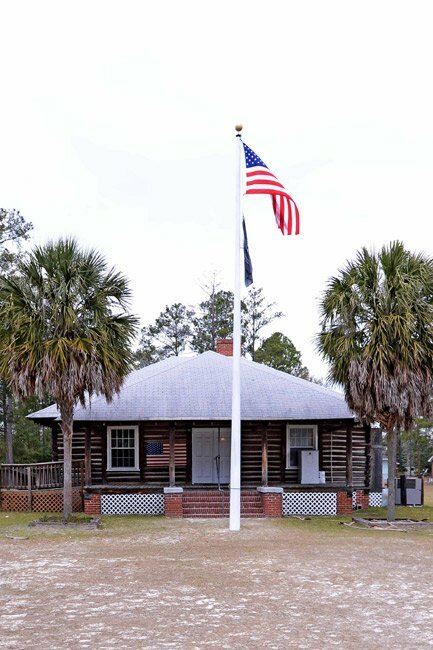 In 1933 the American Legion Post 108 constructed this building of local cypress logs, and local laborers were paid with the federal funds. The acre of land on which the American Legion Hut was built was donated by then-senator George Warren. The small building was designated as a place for residents to hold meetings and recreational events. The City of Hampton officially deeded the property to American Legion Post 108 in 1940, and today it still serves as a community gathering spot. The American Legion Hut is a one-story, T-shaped cypress log building with a truss roof constructed in 1933. The Hut was constructed as and continues to be a meeting hall for the Hampton American Legion Post 108 as well as serving as a site for civic and social events. Local workers built the Hut supported by funds from the Reconstruction Finance Corporation, a federal agency that provided loans for work relief projects during the Great Depression. Construction began on May 8, 1933, and the hut was formally opened to the public on August 2, 1933. The exterior walls of the building were constructed of saddle-notched cypress logs with a white mortar chinking and rest on a brick pier foundation. The hip roof is covered with asphalt shingles. Vaney Bowers and his brother Dee Bowers, both of Hampton County, cut and skinned the cypress logs used to build the cabin. They pulled the logs on mule-driven carts to the construction site. The American Legion Hut in Hampton has served continuously as a meeting place not only for Legion members, but also for community functions such as school dances, town festivals, family reunions, and veterans’ remembrance services.